This beautiful, infrared image shows a new view of the Eagle nebula captured by the European Herschel Space Observatory. 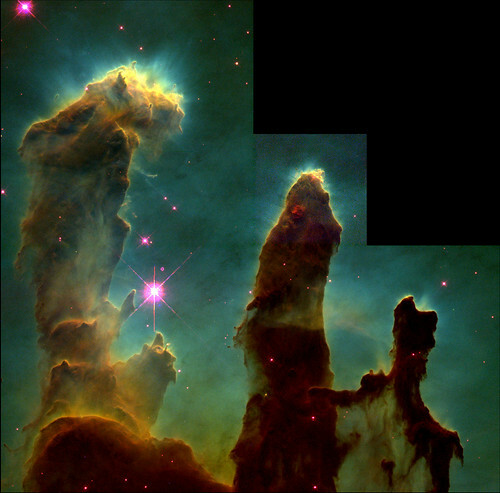 In 1995, Hubble famously captured a visble-light image of the “Pillars of Creation,” a region of star-formation. That image is below – in the above image, that region is shown within the circle. Infrared light is needed to see into the opaque clouds of dust and gas within which stars form. You can read more about what astronomers are learning from this new view of the nebula in the NASA feature. The new Interstellar Boundary Explorer (IBEX) mission has just given us new information about our solar system and what lies beyond, that may help us to better understand how and where our solar system formed, about the forces that physically shape our solar system, and about the history of other stars in the Milky Way. The space between the stars is not totally empty, it’s actually filled with atoms of elements like hydrogen, oxygen, neon, and helium. Hydrogen and helium were created in the Big Bang, but it’s the supernovae explosions at the end of a massive star’s life that spread the heavier elements like oxygen and neon through the galaxy. IBEX looked at the distribution of these elements outside the solar system and found 74 oxygen atoms for every 20 neon atoms in the interstellar wind. In our own solar system, there are 111 oxygen atoms for every 20 neon atoms. The results from IBEX showed that there is more oxygen in any part of the solar system than there is in nearby interstellar space. Scientists also want to understand the composition of the boundary region that separates this interstellar medium from the heliosphere. The Sun’s heliosphere acts as a protective bubble, shielding our solar system from most of the dangerous galactic cosmic radiation that comes from interstellar space. You can read more about IBEX’s findings in this NASA release. There are lots of cool, illustrative graphics at the Science Visualization Studio, too many to post here. But we will embed this short narrated video that talks more about what IBEX is studying. Here’s another mystery that has a new explanatory theory. For several years the Chandra X-ray Observatory has detected X-ray flares about once a day from the supermassive black hole known as Sagittarius A* (or Sgr A*) that lies at the enter of the Milky Way. The flares last a few hours with brightness ranging from a few times to nearly one hundred times that of the black hole’s regular output. The flares also have been seen in infrared data from ESO’s Very Large Telescope in Chile. 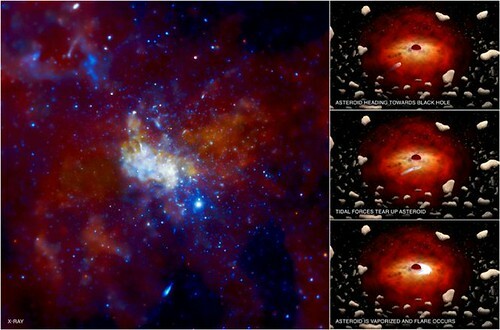 The newest theory to explain these flares is that Sgr A* may be vaporizing and devouring asteroids! Kastytis Zubovas of the University of Leicester in the United Kingdom (and lead author of the report appearing in the Monthly Notices of the Royal Astronomical Society) and his colleagues suggest there is a cloud around Sgr A* containing trillions of asteroids and comets, stripped from their parent stars. Asteroids passing within about 100 million miles of the black hole, roughly the distance between the Earth and the Sun, would be torn into pieces by the tidal forces from the black hole. Read more about this new study over at the NASA Chandra website. 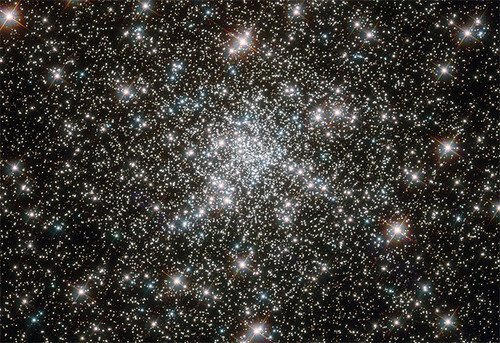 This gorgeous, jewel-box of stars is globular cluster NGC 6752. 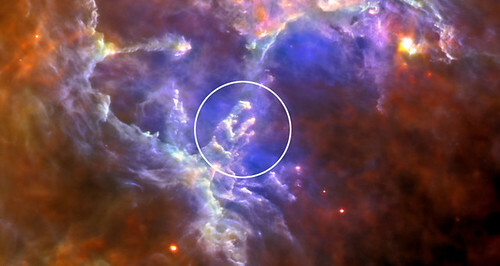 The image was captured by the Hubble Space Telescope. This cluster contains a high number of so-called “blue straggler” stars, some of which are visible in this image. These blue stars have characteristics of stars younger than the other ones in this cluster, despite models that suggest most stars in a globular cluster are about the same age. This makes the origin of the blue stragglers a bit mysterious. Studies of NGC 6752 have shown, however, that up to 38 percent of the stars within its core are binary star systems. 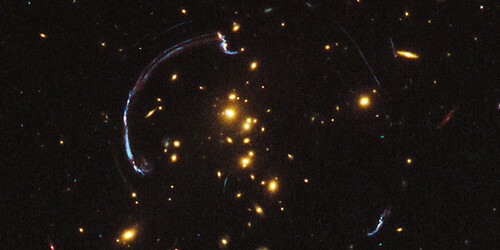 Collisions between these stars could be what is producing so many of the blue stragglers. See the image feature for more information. 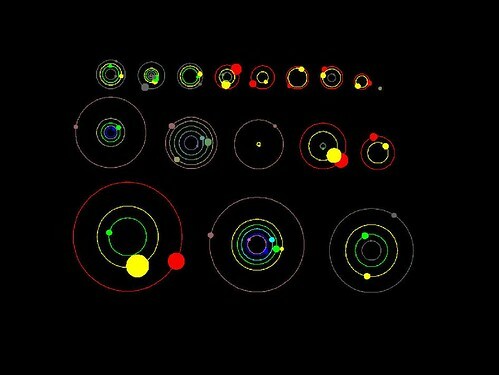 NASA announced that the Kepler mission has found 11 new planetary systems hosting 26 confirmed planets. These discoveries nearly double the number of verified Kepler planets and triple the number of stars known to have more than one planet that transits, or passes in front of, its host star. Head to the NASA release for more about the Kepler exoplanet discoveries! Here is a neat story about how two NASA employees who were part of the NASA FIRST (Foundations of Influence, Relationships, Success and Teamwork) program (which seeks out promising leaders from among young civil servants), got Stephen Colbert to do a promo for NASA.